Take an unforgettable journey from Marrakech to the Sahara and back again! Hike through the Rose Valley, trek into the Sahara on a camel, spend a night in a luxury camp in the middle of the dunes, and so much more! Meet your driver in Marrakech in the morning. 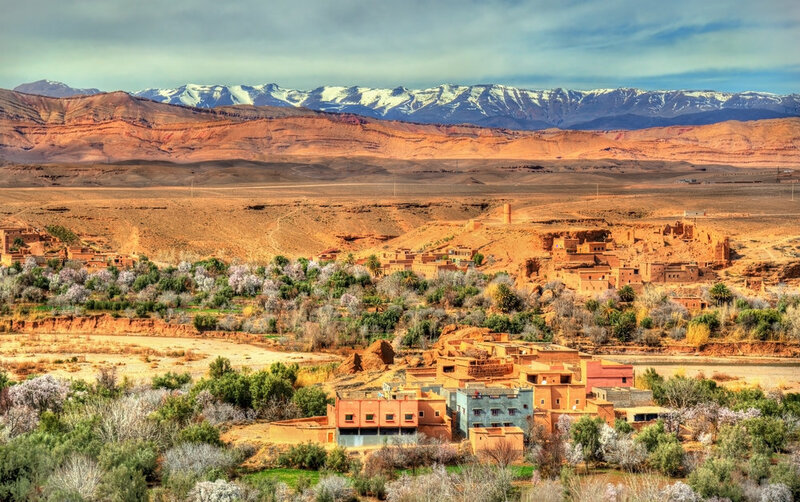 Travel over the Atlas Mountains via Tichka Pass, and visit Ait Ben-Haddou, a UNESCO World Heritage Site. Continue on to Boumalne. Dinner at your riad. Overnight in Boumalne. Depart Boumalne in the morning, and begin your day with a hike through the Rose Valley. Continue on to reach Merzouga in time to take a quad excursion into the Sahara Desert to watch the sunset from the top of the sand dunes. Dinner at your riad. Overnight in Merzouga. Depart camp and begin your return journey. Stop to visit the Dades Gorges outside of Boumalne. Continue on to Ouarzazate, where you will check into your riad. Dinner at your riad that night. Overnight in Ouarzazate. Complete your journey to Marrakech, crossing the Atlas Mountains once more via Tichka Pass. Arrive in Marrakech in the afternoon and check into your hotel near the Jemaa el Fna square. Overnight in Marrakech.